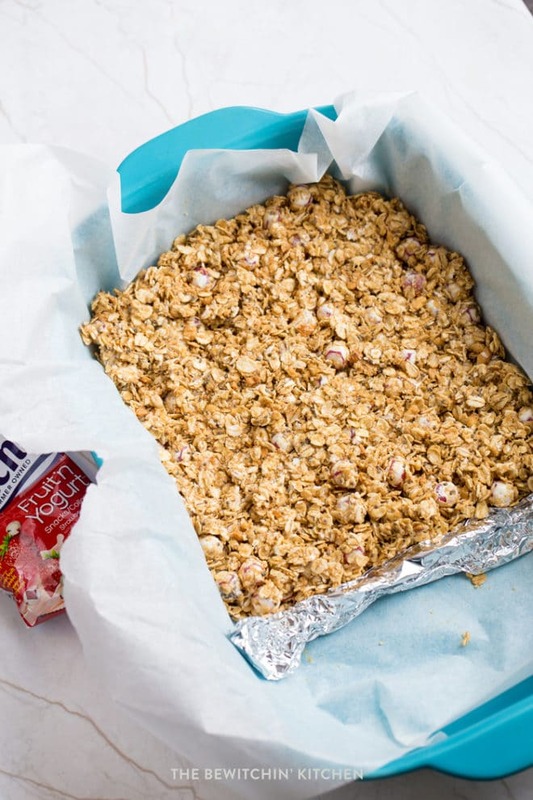 This recipe for Strawberry Yogurt Granola Bars is sponsored by Welch’s® Fruit Snacks. I am being compensated for this post. All comments and opinions are my own. This easy granola bar recipe is a fun way to get the kids involved in making their lunch. Not only do these homemade granola bars taste amazing but they’re also no bake, which allows for a no fuss prep! 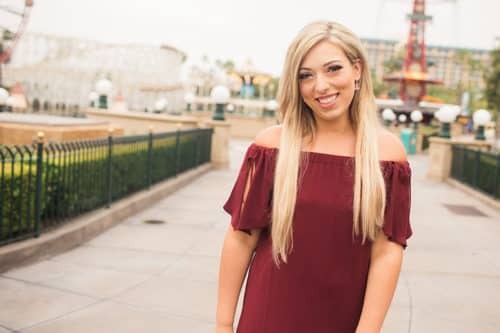 Back to school is right around the corner, are you ready? Can I be honest with you here? I blog about food but I struggle with packing lunches. I’m always on the lookout for fuss-free and easy ideas that make me happy (because of the no effort) and him happy because they taste good. 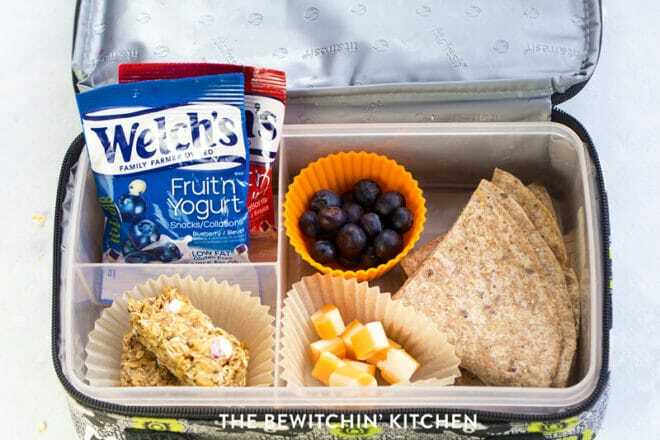 It’s not always easy to find simple snacks to throw in my son’s lunchbox, so I search for great snacks (like Welch’s Fruit ‘n Yogurt Snacks) and like to make my own granola bars and granola bites! So while I was brainstorming some ideas to spruce up the homemade bars and balls, I thought why not combine no-bake granola bars and my sons’ favorite Welch’s snack. Have you tried these yet? They’re so darn good! My son is constantly asking for them for his lunch and for a snack at home, so I wanted to know what the big deal was and tried a few. Those few turned into two bags. They’re delicious, and they didn’t seem as “kid-like” as other fruit snacks, so I would feel perfectly professional bringing these into an office environment (I have a few in my diaper bag for snacks on the go – for me, not the kids). Kid and parent snack in one go? Score! They’re also available at Wal-Mart, which is convenient for so many of us. Why are they so good? My bet is that it’s because they are such a delicious snack that you can also take on the go! Those two bags made me think of a granola bar I used to eat back in the day, they had similar tastes and I wanted to do my best to recreate it. 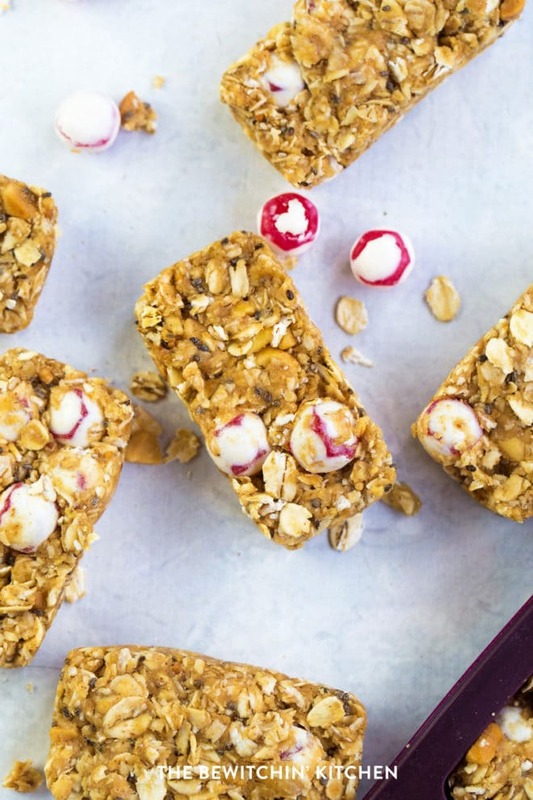 Are you ready for one of the easiest granola bar recipes ever? 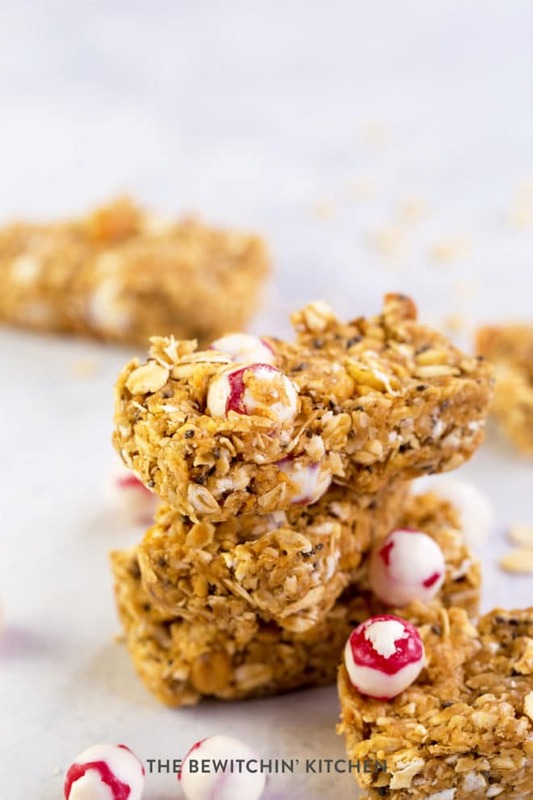 These no-bake, soft ingredients help create a chewy granola bar that is simple to pack in the kidlets’ lunches. 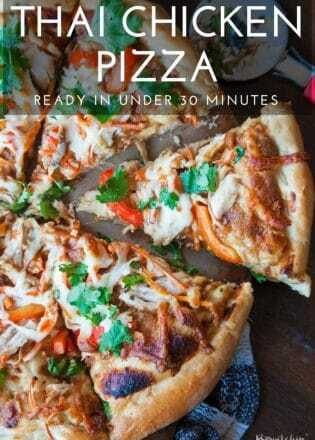 All you have to do is mix up the ingredients, press into an 8×8 pan (lined with parchment for easy clean up) and freeze for an hour to firm up. 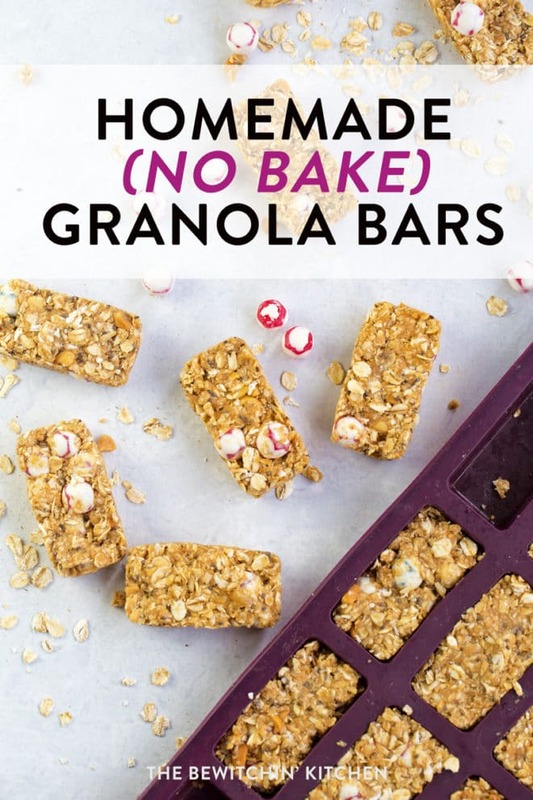 Randa’s Tip: Whether you make granola bites or homemade granola bars, the recipe is the same. Simply roll into balls for the bites. Make the granola bar base and keep it like that. Create a creamy yogurt glaze and coat the top. *This is perfect for cold months, but I find that when it’s warm in the house it will melt. 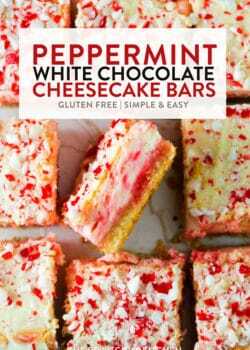 Drizzle white chocolate over top for White Chocolate Strawberry Granola Bars. Granola bars sound like work, but I promise they’re not. They’re made with everyday ingredients and are rich with nut-free butter with surprise bursts of fruit and yogurt thanks to Welch’s Fruit ‘n Yogurt snacks. Save on Welch’s Fruit ‘n Yogurt snacks by grabbing this coupon! 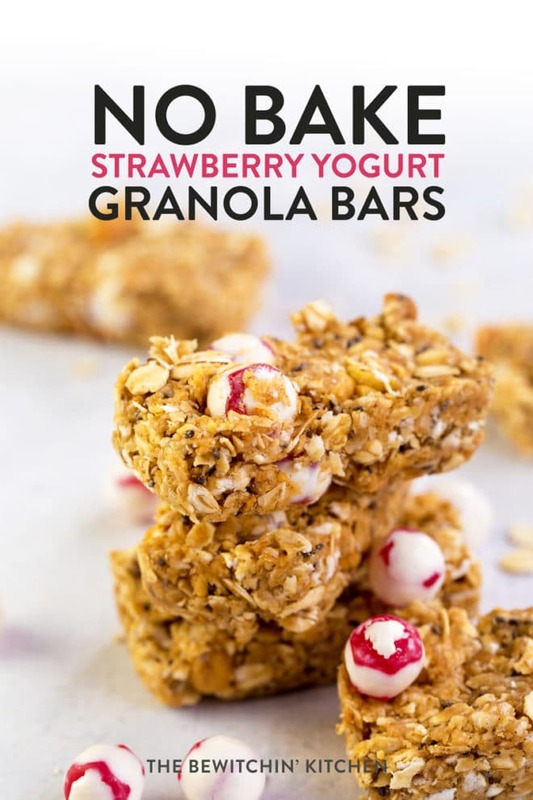 These chewy, no bake strawberry granola bars use Welch's Fruit 'n Yogurt Snacks for a boost of flavour. Easy and soft homemade granola bars are perfect for kid's school lunches and a fun snack idea! 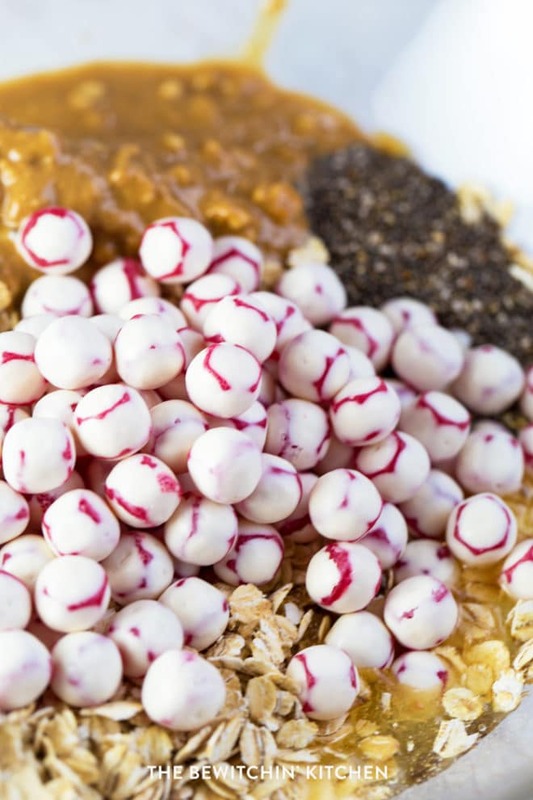 Combine all five ingredients for the energy bites in a large bowl and mix together (it works best if you mix with your hands). Line an 8x8 pan with parchment paper and press the mixture into the pan. 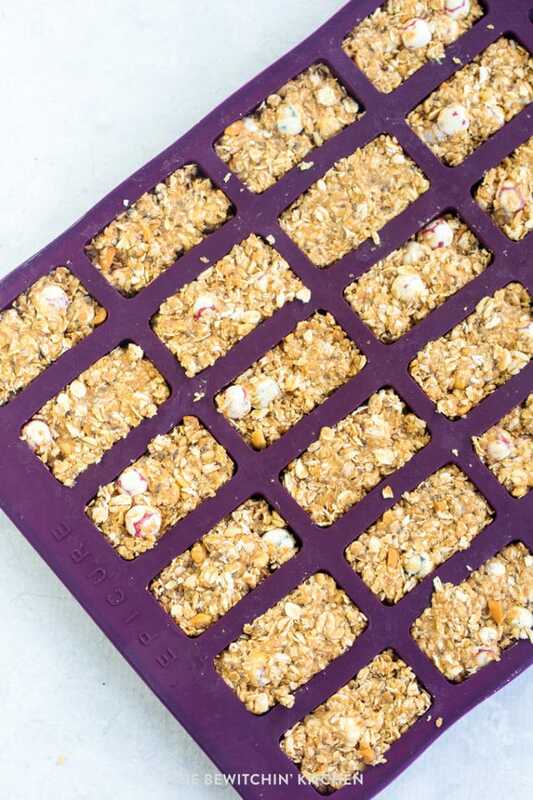 Another option is to use a rubber granola bar mold. Move it to the freezer and freeze until set, about an hour. Store them in the fridge for the week. After pressing the granola mixture into the pan, combine the ingredients into a separate bowl and mix until smooth. Spoon the yogurt mixture into a piping bag and drizzle over the bars. Another option is to pour and spread with the back of a spoon. Melt the white chocolate in a bowl in the microwave for a minute and a half, thirty seconds at a time, until smooth. Those look tasty. They’d be perfect for when I’m on the go in addition to putting in my kids’ lunchboxes. I LOVE that they’re no bake. Those granola bars look wonderful! They’re excellent as an addition to the kids’ lunches. 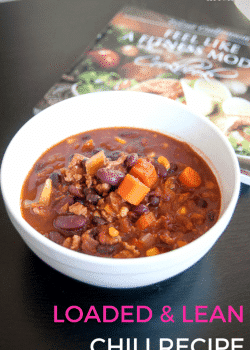 They look fairly simple to make too! These look absolutely delicious. I wouldn’t be able to stop eating them. I haven’t tried Welch’s Fruit ‘n Yogurt Snacks yet but now I know what I am buying next. These bars are really cute and I bet they are yummy! I love these fruit snacks because the yogurt coating on them gives them such a nice texture. I never would have thought to add to a granola recipe. 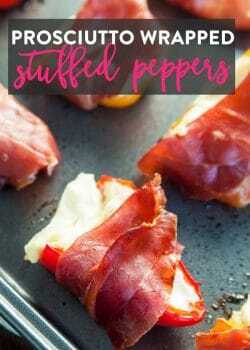 What a super cool way to add flavor! 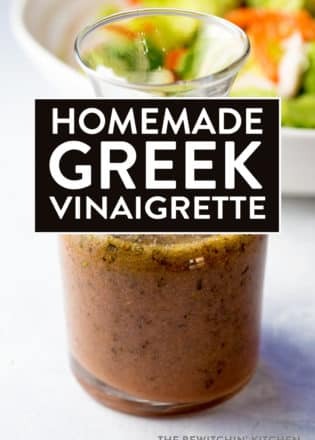 That recipe looks really good. I’m sure my entire family would love these. I think this would be great for a quick breakfast. Can’t wait to try them! 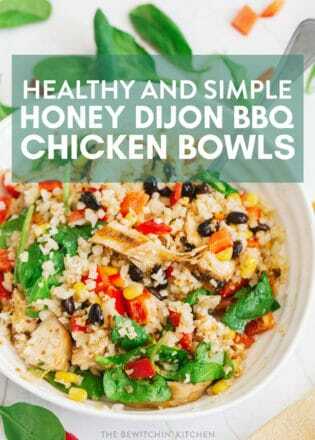 I love easy recipes and these look absolutely amazing! I’m definitely trying these for the kids! this looks amazing. i need to try this as i’m sure my kids would love. Mine does! I have made it 5 times in the last three weeks haha. I really love some no bake recipes. These look like they would be so amazing. We’ve never tried to make our own granola bars before. I guess I didn’t realize it was so easy to do! Where are the chocolate chips?! These look delicious. This would be a great thing to make for back to school. They can grab it and go. I struggle with the kid’s lunches as well. 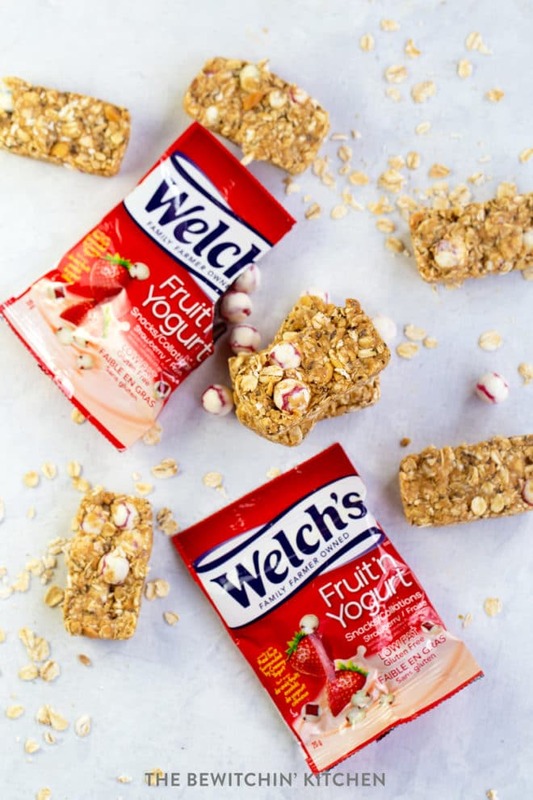 These granola bars would make a great healthy snack, but the Welch’s Strawberry Fruit ‘n Yogurt snack look like a fantastic snack all on their own too! 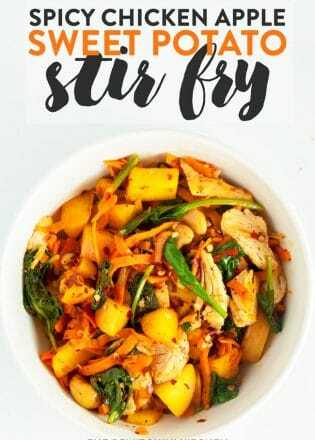 I’m loving this recipe. 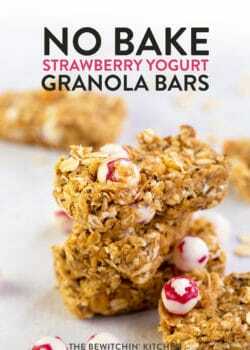 My girls will love homemade strawberry yogurt granola bars. They look amazing. These look so delicious! I need to make them for my kids!